Initially European immigrants to the Atlantic coast of North America tried to gain some understanding & control over the new weather patterns & geography they were encountering by creating physical spaces to meet their basic needs for shelter, food, safety, & family. When this was accomplished, they often attempted to acquire & shape personal spaces to project their desired image to others - their wealth, power, refinement, beliefs, & knowledge. Spider Flower is a self-seeding annual native to southern regions of South America and was introduced to England via the West Indies in 1817. 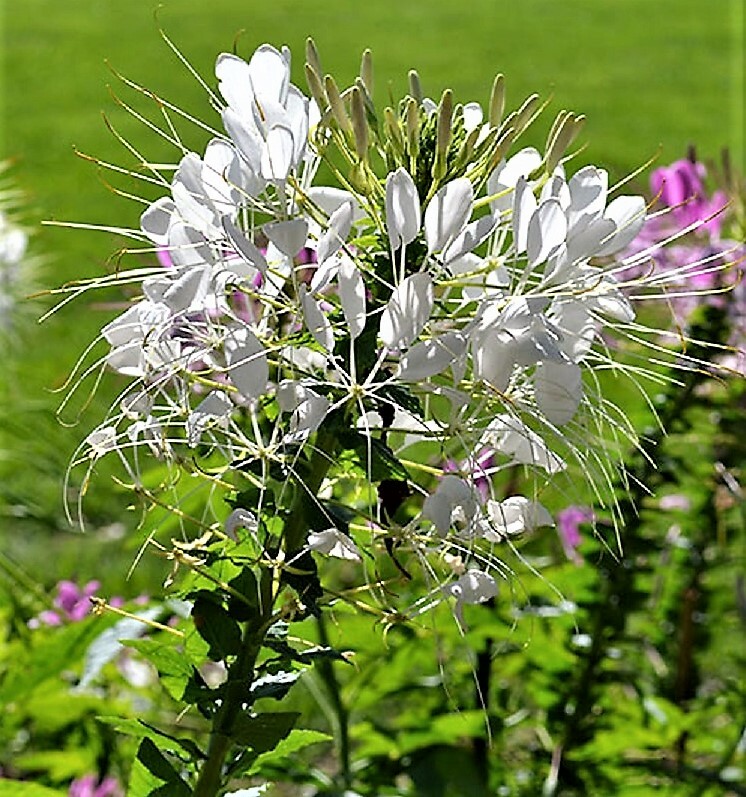 Also called Spider Legs and Grandfather’s Whiskers, it was considered a choice flowering annual by Robert Buist in his 1839 edition of The American Flower Garden Directory. 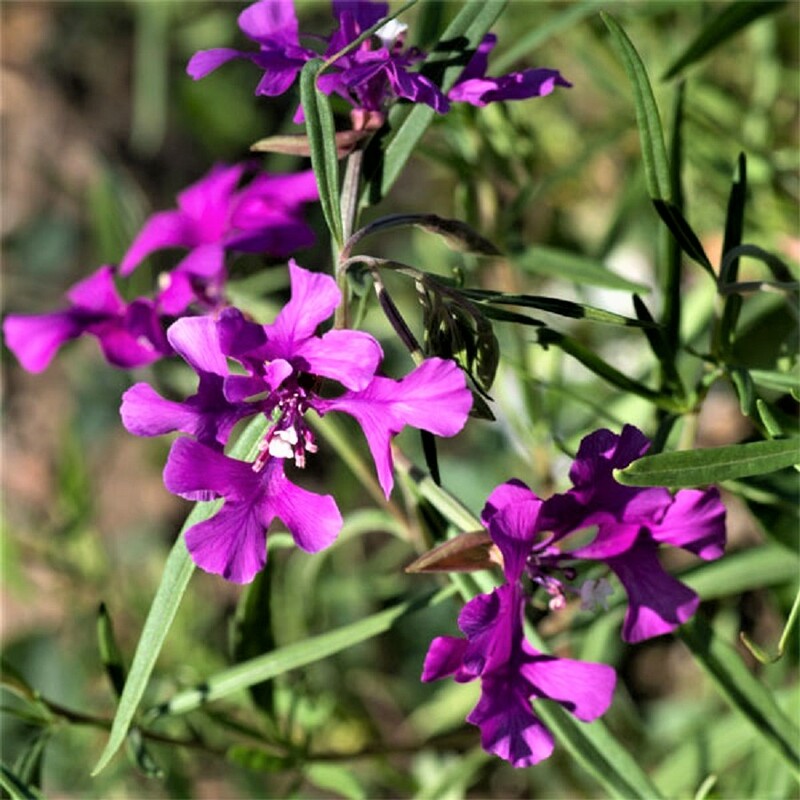 Its showy pink and white flowers, large multi-lobed leaves, and strong growth habit make it a handsome addition to the flower border in summer and fall. Attracts bees and butterflies; deer resistant. 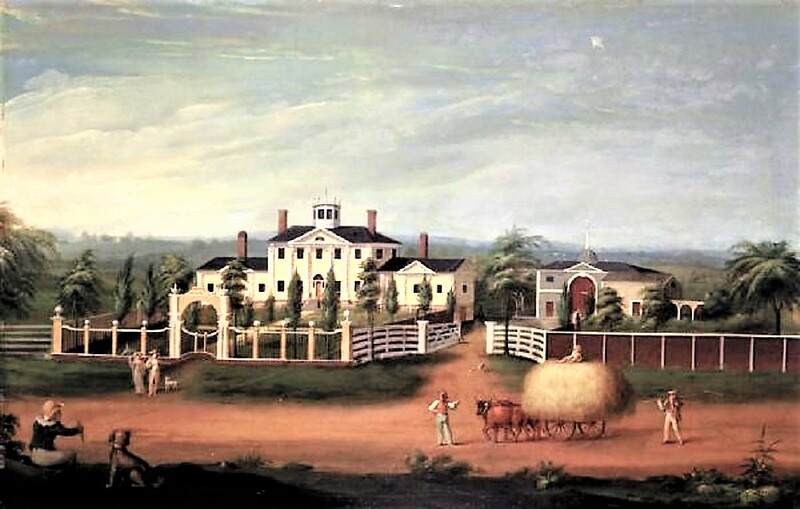 Philadelphia seed dealer & nurseryman Bernard M’Mahon’s (1775-1816) main motive for writing the 1806 American Gardener's Calendar was to expand his profitable nursery enterprise, which supplied seeds & plants to many gardeners up & down the Atlantic coast, from gentry to artisan. In 1993, Monticello's legendary gardener & historian Peter J. Hatch wrote a Twinleaf article on "Bernard McMahon, Pioneer American Gardener." Hatch draws a picture of the Philadelphia nurseryman McMahon as a shrewd businessman who forwarded the newest vegetable&flower varieties to Thomas Jefferson, who then would often follow the directions in the McMahan's American Gardener's Calendar step-by-step when planting in his flower beds or vegetable gardens. McMahon also served as curator for the plants collected by the Lewis&Clark expedition & published the 1st seed catalog in the 1803 United States. His American Gardener's Calendar, the most comprehensive gardening book published in the United States in the first half of the 19C; popularity&influence can be gauged by the 11 editions that were printed up to 1857. The 648-page Calendar was modeled on a traditional English formula, providing month-by-month instructions on planting, pruning,&soil preparation for the various horticultural divisions -- the Kitchen Garden, Fruit Garden, Orchard, Nursery, etc. McMahon borrowed extensively from popular earlier English works but made a concerted effort to break away from English traditions in the way he celebrated the use of native American ornamentals; championed large-scale cider&seedling peach orchards that could be grazed with livestock;&admitted the harsh realities of eastern North America's continental climate. 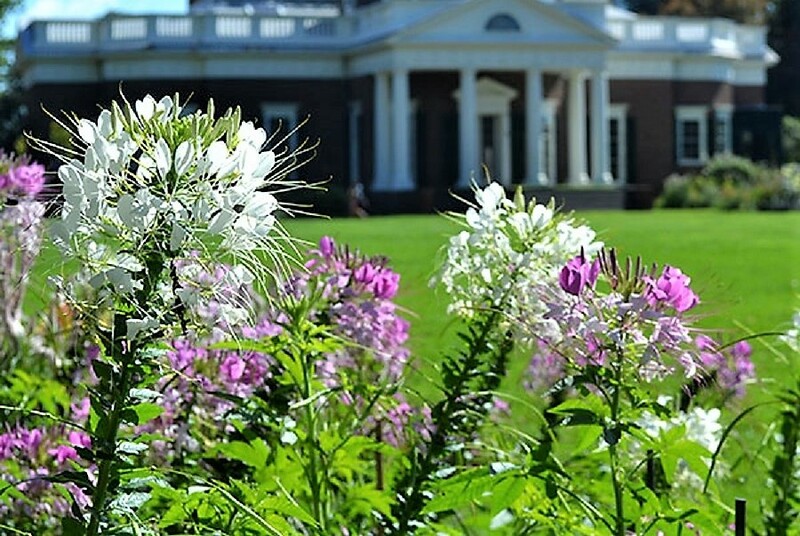 McMahon reinforced Jefferson's pride in the culture of American plants. American gardeners were urged to comb the local woodlands&fields for "the various beautiful ornaments with which nature has so profusely decorated them." Wildflowers, according to McMahon, were particularly suited for the hot, humid summer, when American gardens "are almost destitute of bloom." McMahon continued, "Is it because they are indigenous that we should reject them?" In 1808 McMahon purchased 20 acres for his nursery&botanic garden that would enable him to expand his business. John Jay Smith, editor of The Horticulturist, noted in 1857 "Many must still be alive who recollect its [the store's] bulk window, ornamented with tulip-glasses, a large pumpkin,&a basket or two of bulbous roots; behind the counter officiated Mrs. M'Mahon, with some considerable Irish accent, but a most amiable&excellent disposition. Mr. M'Mahon was also much in the store, putting up seeds for transmission to all parts of this country&Europe, writing his book, or attending to his correspondence,&in one corner was a shelf containing a few botanical or gardening books; another contained the few garden implements, such as knives&trimming scissors; a barrel of peas,&a bag of seedling potatoes, an onion receptacle, a few chairs,&the room partly lined with drawers containing seeds, constituted the apparent stock in trade of what was one of the greatest seed houses then known in the Union. Such a store would naturally attract the botanist as well as the gardener,&it was the frequent lounge of both classes, who ever found in the proprietors ready listeners as well as conversers. They were rather remarkable,&here you would see Nuttall, Baldwin, Darlington,&other scientific men, who sought information or were ready to impart it." Almost all of America’s earliest indigenous gardening books served as the liaison between the nurseryman & an emerging middle-income group of home gardeners.As increasing leisure time & interest in gardening grew, there were not enough trained professional gardeners to go around nor excess funds to employ them. A new how-to-do-it manual was just what the young country needed. English gardening books, American gardening books, plants & other supplies, & the practice of gardening itself fit into the new nation’s burgeoning capitalistic fervor at the end of the 18th century. In addition to professional gardeners & seed dealers & nurserymen like McMahon, whose numbers grew quickly after the Revolution, non-professional gardeners of every stripe often sold nature’s products to gain extra income. George Washington encouraged his gardener to sell extra nursery stock for a profit, one-fifth of which he allowed the gardener to keep. Nobleman Henri Stier, who had fled Belgium during the French Revolution, had a bulb sale, when he moved back to Europe from Annapolis in 1803. Once he had returned to Belgium, he bought bulbs in Europe & shipped them to his old Chesapeake neighbors. Annapolis craftsman William Faris, in his fiscal account book for October 23, 1799, noted receiving the substantial sum of $40 for tulip bulbs from John Quynn. Fellow Annapolitans Alexander Contee Hanson & Thomas Harwood, & Captain John O’Donnell from Baltimore visited the silversmith's garden to mark tulips & hyacinths that interested them; after the blooms faded Faris dug up the marked roots & sold, or traded, them to the gentlemen. On June 1, 1806, Meriwether Lewis “met with a singular plant today in blume” and collected it "on the steep sides of the fertile hills" northeast of Kamiah, Idaho. Clarkia was named for William Clark, co-captain of the expedition. Also called Ragged Robin, this showy annual with bright satiny pink to lavender flowers was popular in American seed catalogs of the mid-19th century. This view was taken from the burying-ground on Copp's Hill, in Boston. Bunker Hill Monument, in its unfinished state, on Breed's Hill, and Bunker Hill, a little to the northward, are seen in the distance in the central view. A part of the buildings connected with the U. S. Navy Yard are seen on the extreme right." This print is from "Historical collections… relating to the history of every town in Massachusetts" by John Warner Barber (1798-1885) . Also known as Cornflower, Bluebottle, and Bleuette, Bachelor's Button is an easy-to-grow, self-seeding, cool-season annual with bright blue flowers that has been popular in America since colonial times. 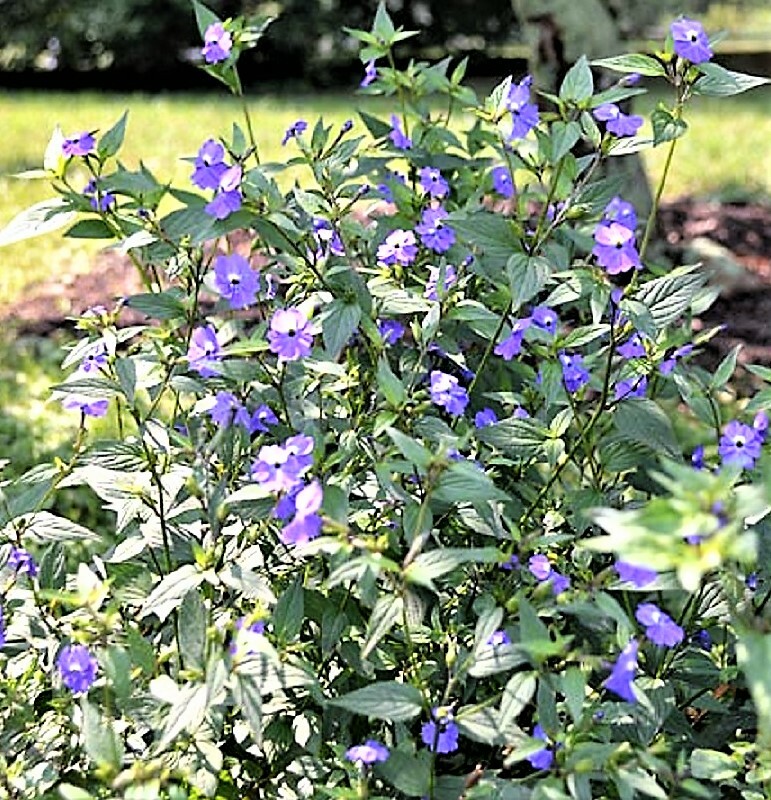 Philadelphia nurseryman Bernard McMahon offered it in five colors in 1804 -- purple, red, blue, white, and striped -- and Jefferson included “French pink bleuette” in an 1806 list of flowers. The Poultry-house and yard are rooms; and kept sweet by being frequently cleaned out; and fresh sand and gravel are strewed in the yard. Their food is to be steamed potatoes and meal, in winter; cut grass, potatoes and a little meal in summer. Poultry ranging at large, feed on grain, feeds, grass and insects. Gravel is necessary to them. A Noisette rose bred in France in 1830 by Maréchal, ‘Lamarque’ is a cross between ‘Blush Noisette’ and ‘Parks’ Yellow China.’ First offered in America in 1841 by Prince Nursery on Long Island, this rose’s virtues as a climber were recognized by Robert Buist in The Rose Manual (1854): “It makes a splendid pillar rose, frequently growing ten feet in one season.” ‘Lamarque’ displays the two main features of all Noisettes: it is highly fragrant and blooms repeatedly. Michele Felice Corne (1752–1845) New England Country Seat. 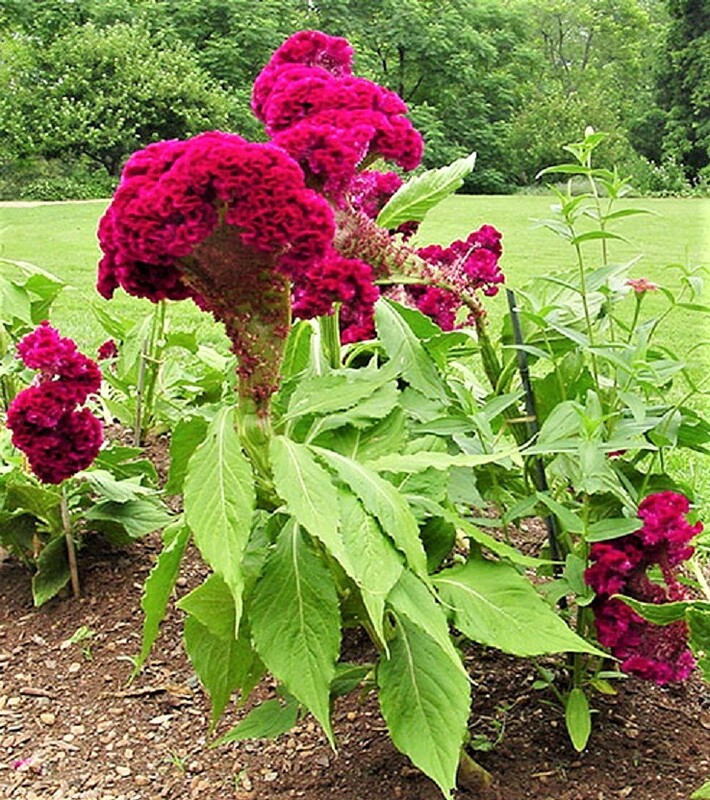 Thomas Jefferson noted the planting of seeds of “Cockscomb, a flower like the Prince’s feather,” in 1767. Still today, the shockingly curious flowers of the Cockscomb delight visitors to Monticello. The seeds here are Cramer’s Burgundy, a prolific, well-branched variety that produces wine-colored blooms 2-6” wide. The Mansion, is airy on every fide. The offices, being on the northeast and northwest angles, leave the mansion open to the south, east, and west, in a clean lawn: and from the north rooms there is a view of the farm yard and its business. Seeds of this hardy, cool-season annual were planted by Jefferson at his boyhood home, Shadwell, in 1767. 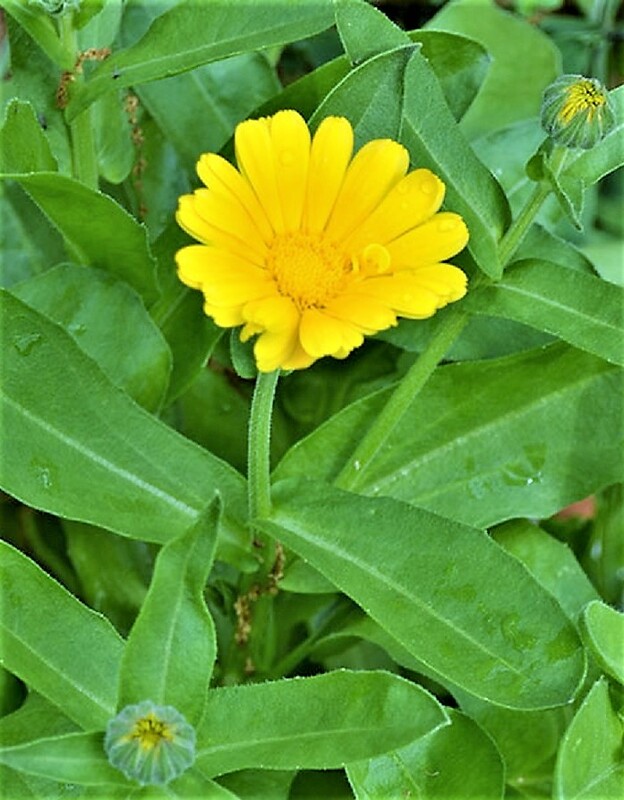 Often called "Marygold" by gardeners before 1800, this self-seeding species with single yellow and orange flowers has been used for culinary and medicinal purposes since the Middle Ages. The Ice-house is to be detached from the milk-house, that it may be clear of all moisture, and receive air on all fides. The ice-house at Gloster point, near Philadelphia, strongly recommends that it be mostly above ground. 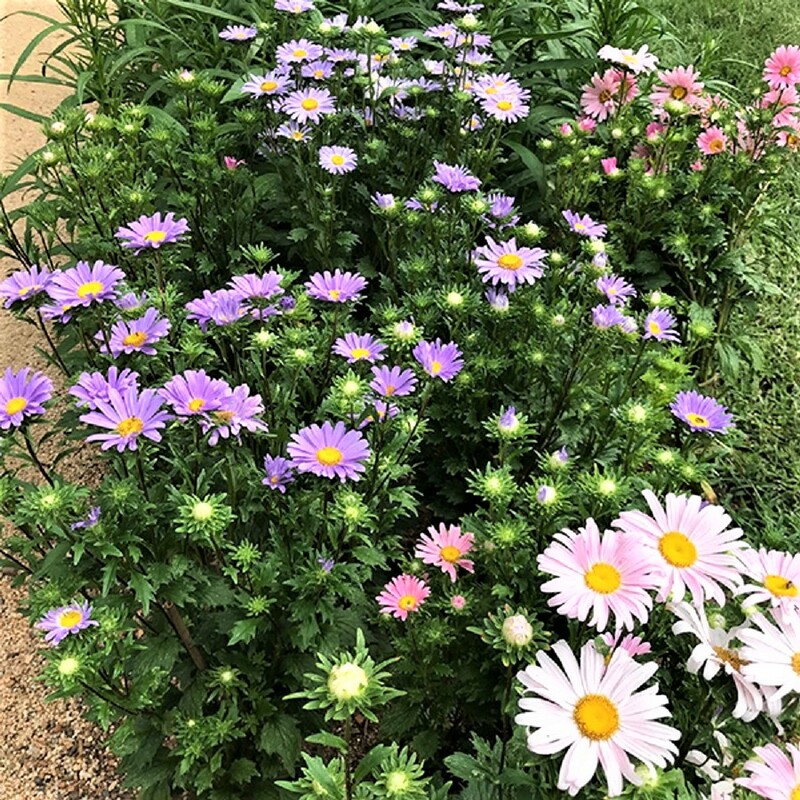 Four feet under ground, six above ground and twelve square, would hold 1440 solid feet; which is enough for family and milk house purposes though very freely expended..
China Aster seeds were first sent to Paris from China in 1728 by a Jesuit priest. 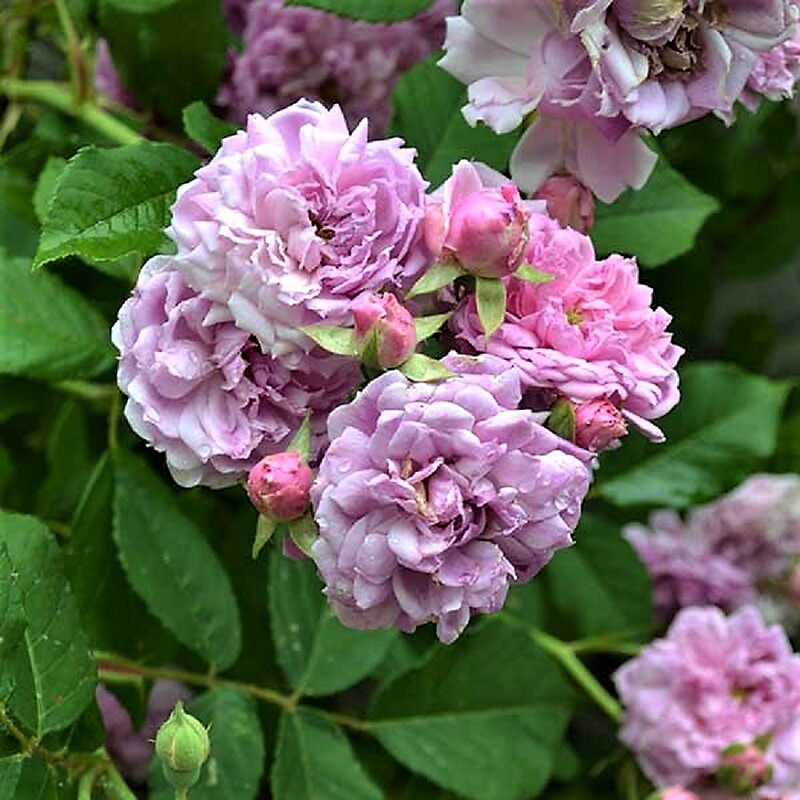 This showy annual flower was cultivated in America as early as 1737 by Williamsburg's John Custis and it grew in popularity in European gardens through the 18th century. By 1804 Bernard McMahon of Philadelphia was selling eleven cultivars of Aster chinensis in a variety of “sorts” including double and quilled forms. 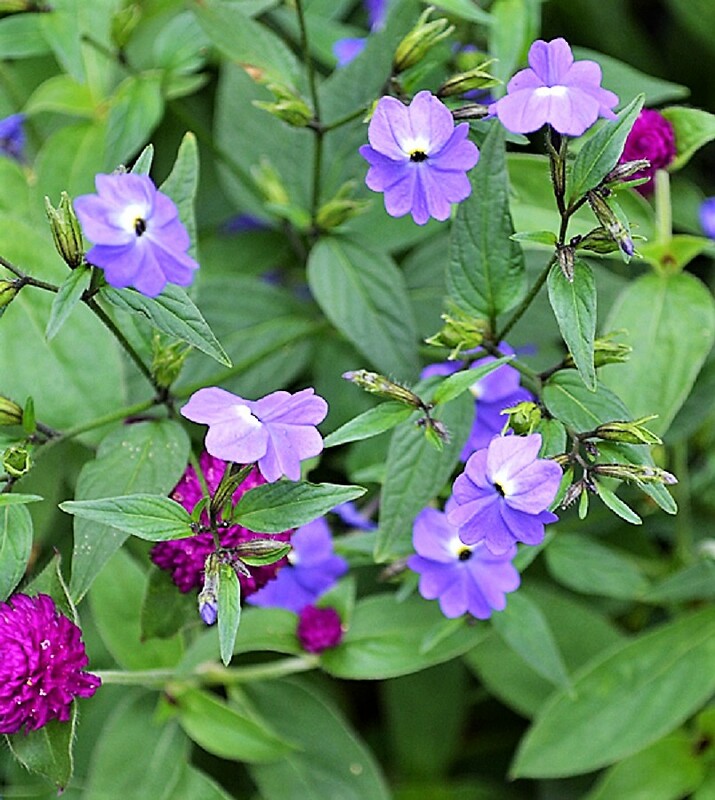 These seeds represent a simple, single-flowered form of China Aster in shades of blue and pink with yellow centers that are good for cutting. The Milk-house adjoins the Laboratory, which is a scalding house to it. It may be two feet under ground. The offal milk is conveyed to the pigs in wheel-barrows, and might be conveyed in a tube, under ground, to the pig-stie. Ice is at hand for hardening butter as it is taken from the churn and worked on a cold marble table. Water cold from the pump is constantly ushered, through pipes, to an upper shelf, and passing round the room, falls on the under shelves and runs off.. 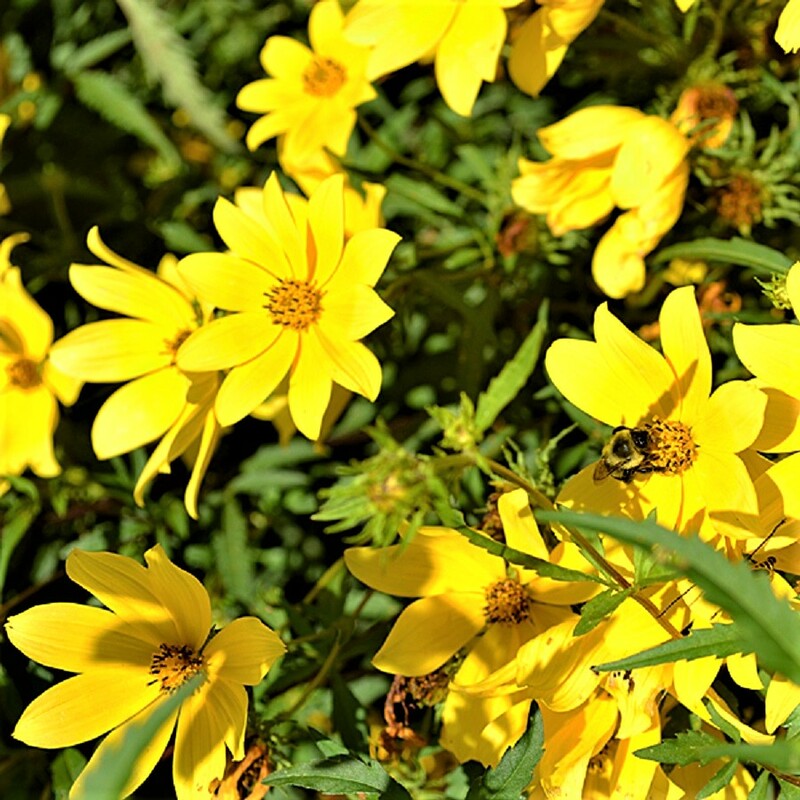 This showy, self-seeding, North American annual wildflower bears abundant bright yellow, daisy-like flowers on slender stalks from late summer into early autumn. Tickseed Sunflower is so named for the appearance of its dark brown, flattened seeds. The robust, bushy plants boast delicate, deeply-dissected foliage on green or reddish, multi-branched stems. The flowers are attractive to butterflies, bees, and other pollinators. Pigeon-house. Pigeons feed expensively, when it is alone on the corns: but they also feed on many wild feeds. They make an agreeable variety on the table; but ought not to be suffered to become too numerous; and therefore their house is to be of a moderate size. Amethyst Flower, or Bush Violet, will produce an airy mass of tiny, amethyst-blue flowers throughout the summer in garden beds or containers. Named after Johan Browallius (1707-1755), a Swedish botanist, physician, and bishop, this self-seeding, South American species was introduced into cultivation in 1735, and was recommended by Philadelphia nurseryman Bernard McMahon in The American Gardener’s Calendar (1806). 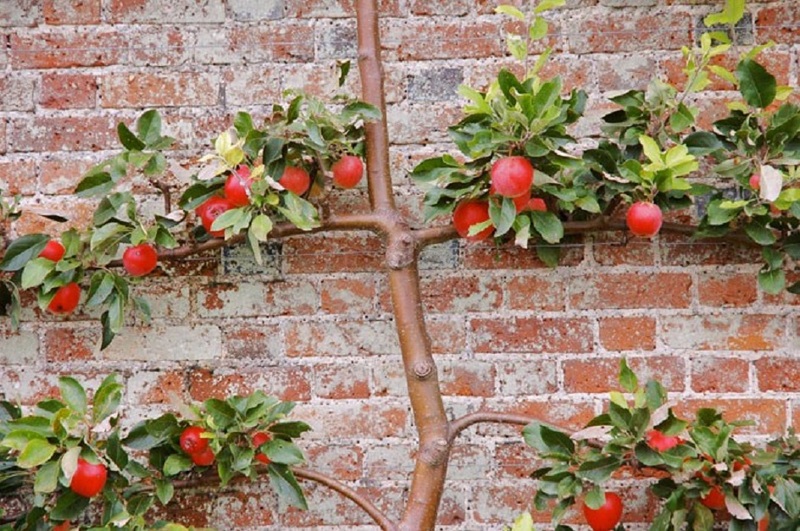 In the British American colonies, an espalier was a lattice-work or frame-work or wall support system, sometimes defining the boundry of a garden, upon which ornamental or bearing fruit trees were pruned & trained. 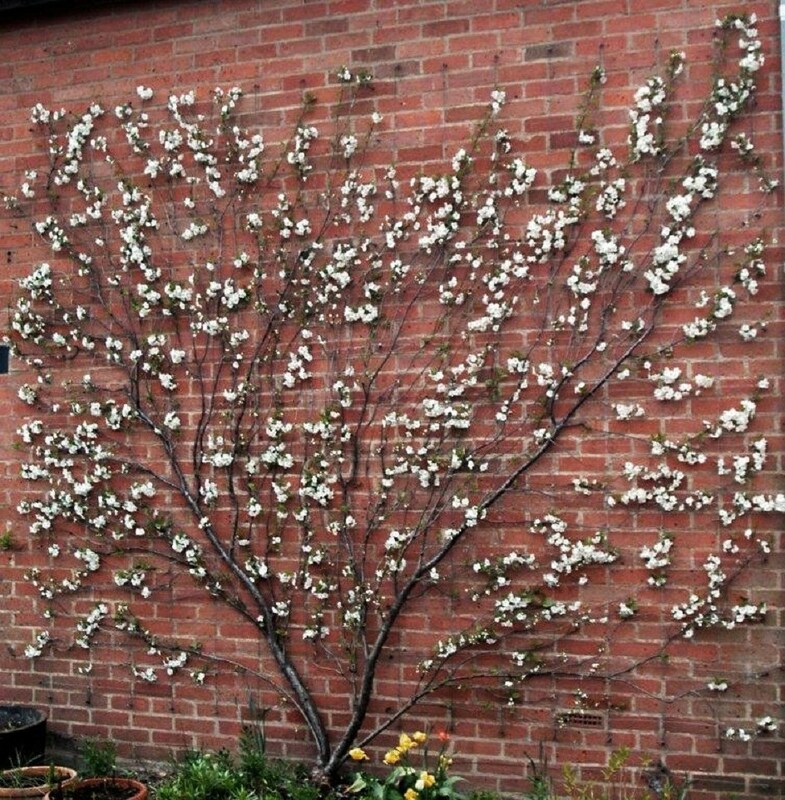 Espaliered fruit trees were often used to create a focal point and as a form of art, as well as for the practical fruit that they produced. 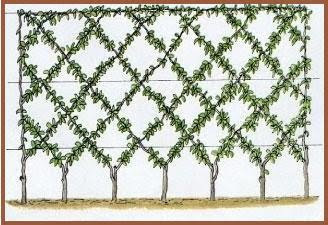 Espalier, a French word derived from the Italian spalliera, which means "something to rest the shoulder (spalla) against," is the process of controlling plant growth in a flat plane, usually against a wall or fence, or along a free-standing trellis. 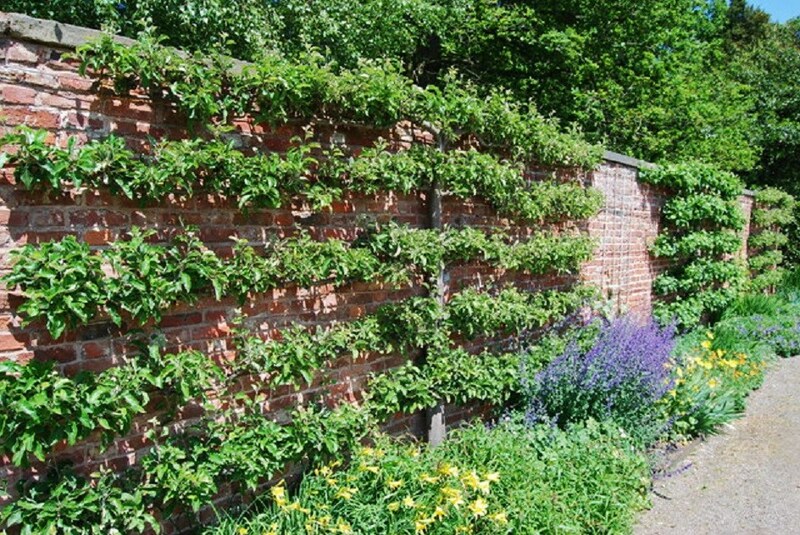 Trees espaliered on a wall were often called wall trees or wall fruit. 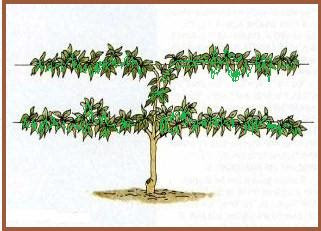 The term espalier also refers to the plant itself grown in this way. 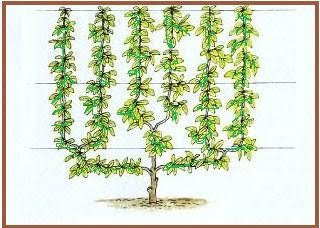 Originally the term espalier defined only the trellis, or frame, on which the plant was trained. 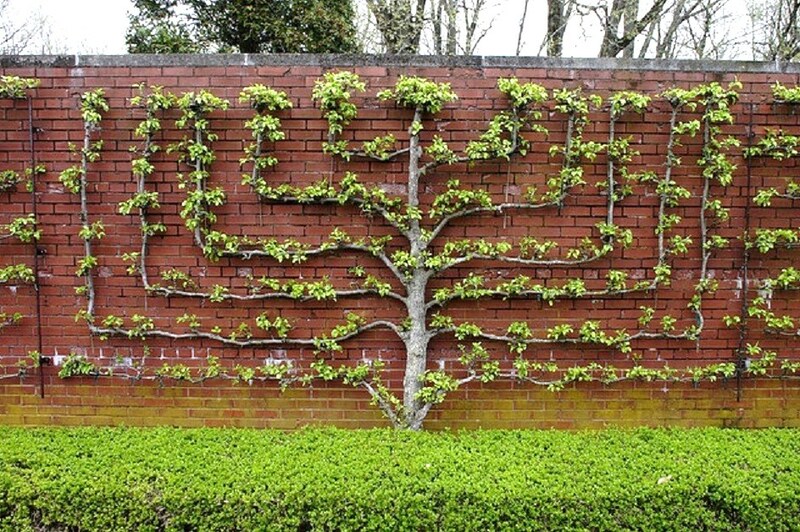 The practice of espalier may go back to early Egypt, where tombs from about 1400 BC have been found with paintings of espaliered fig trees. 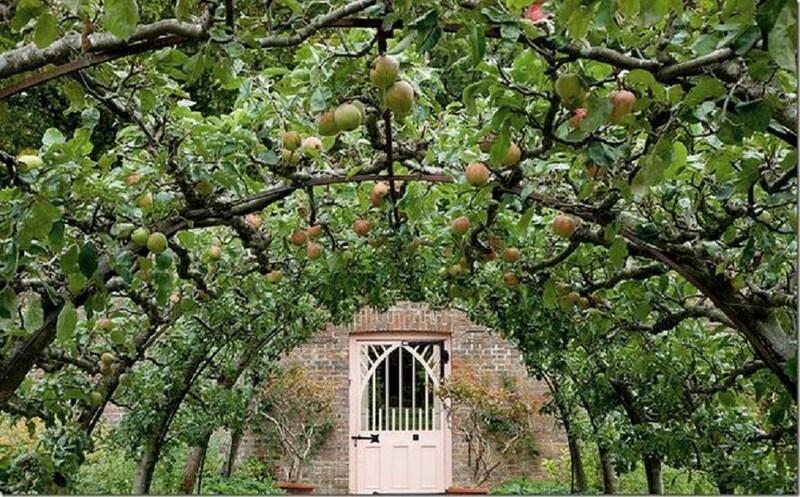 In the Middle Ages in Europe, manuscripts depict espaliered fruit inside walled monastery gardens or castle courtyards economically bearing fruit without filling the limited open space. 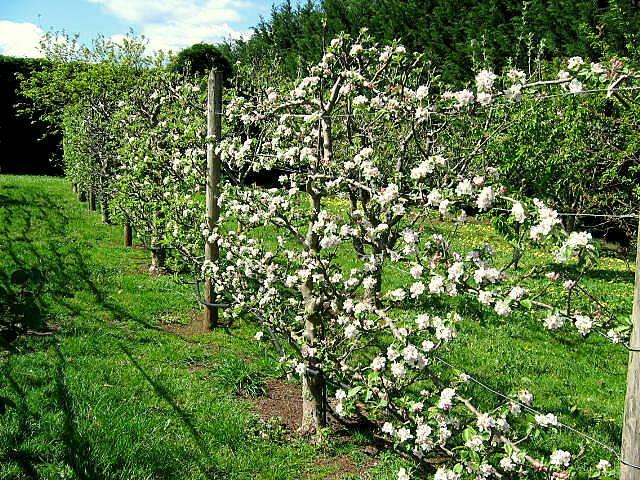 The classic European styles can be traced back to the 16th & 17th centuries, where they were developed in the marginal climates of northern France & England for more efficient fruit production. 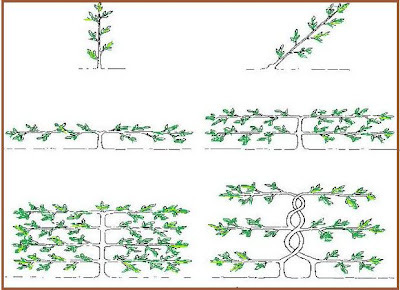 There are numerous espalier forms ranging from the very simple, free-flowing natural & informal designs to complicated formal patterns. The most common formal styles are candelabra, tiered, basket weave, fan, cordon, pinnate, palmate, or Belgian or double lattice or diamond motif. 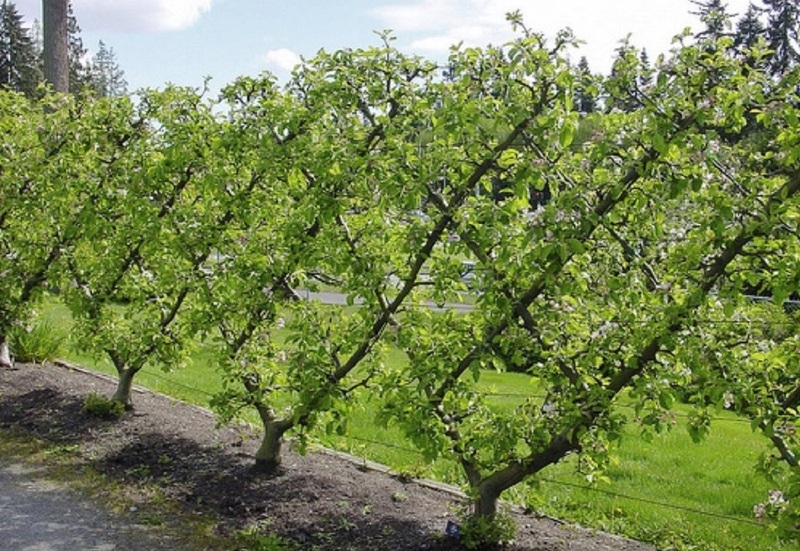 The wall tree or wall fruit system was meant to protect plants from wind or weather and, hopefully, to enable espaliered trees to bear fruit earlier than stand alone trees, either natural or espaliered. 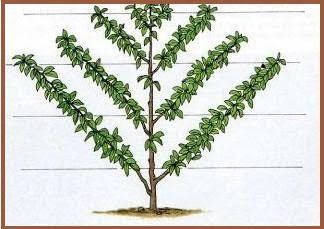 In 1736, Thomas Hancock at Boston, Massachusettes, wrote to England requesting information on the availability of young trees, "Send me a Catalogue of what Fruit you have that are Dwarf Trees and Espaliers." Visiting Englishman James Birket wrote in September of 1750, about Captain Godrey Malbone's estate at Newport, Rhode Island, "The Surface of the Earth before the house is a Handsome Garden with variety of wall fruits And flowers...this house & Garden is reckond the wonder of that part of the Country." In Baltimore, Maryland in 1800, the property of Adrian Valeck was listed for sale in the Federal Gazette, "A large garden in the highest state of cultivation, laid out in numerous and convenient walks and squares bordered with espaliers, on which...the greatest variety of fruit trees, the choicest fruits from the best nurseries in this country and Europe have been attentively and successfully cultivated." 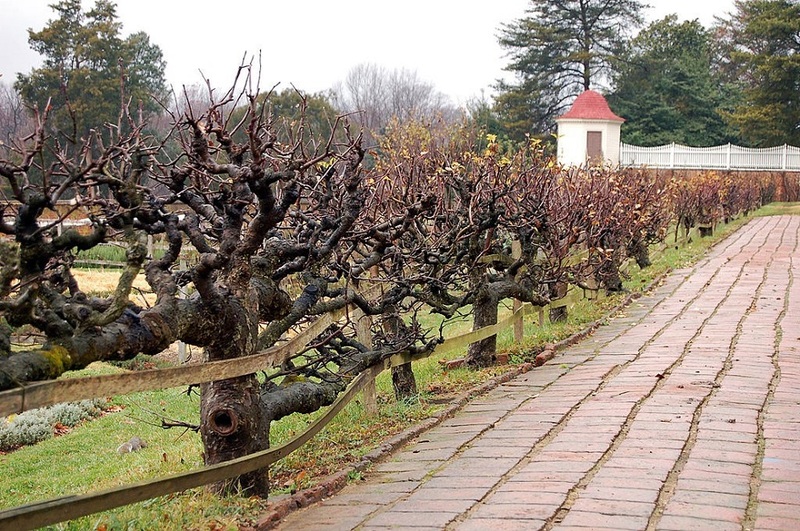 John Gardiner and David Hepburn advised gardeners in their 1804 The American Gardener, published in Washington, District of Columbia, that January was the month to "prune espalier trees." 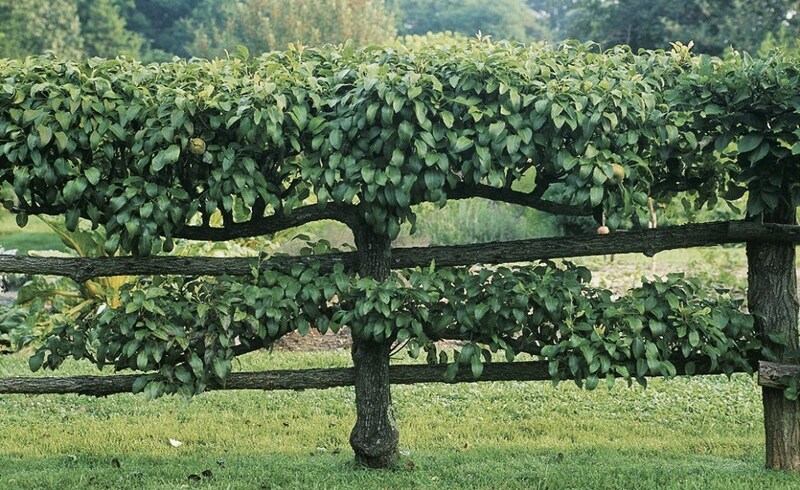 In his 1806 American Gardener's Calendar, Bernard M'Mahon of Philadelphia, Pennsylvania, wrote, "Espaliers are hedges of fruit trees, which are trained up regularly to a lattice or trellis of wood work, and are commonly arranged in a single row in borders, round the boundaries of the principal divisions of the kitchen garden; there serving a double or treble purpose...profitable, useful, and ornamental. or in summer, to see the fruit of the different sorts advancing to perfection, and in autumn arrive successively to maturity? "And as the trees are arranged all of an equal height, not exceeding six feet, closely furnished with branches, ranged horizontally at regular distances one above another, from the very ground upwards, the fruit hereby are exhibited to great advantage, and being low, and the branches fixed, are convenient to pull, and not liable to be blown down by wind. 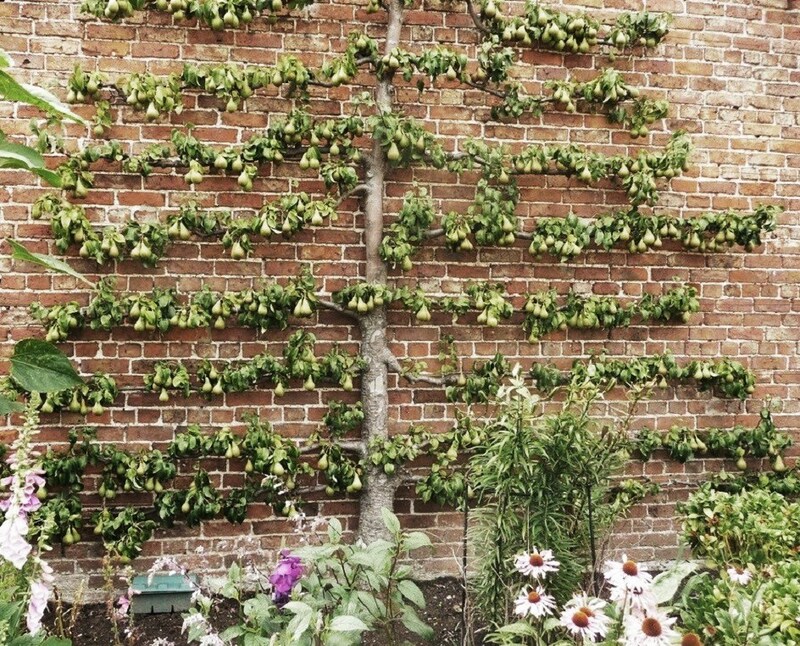 "Trellis's are also used occasionally for wall trees, where the wall does not admit of nailing the branches immediately against it." 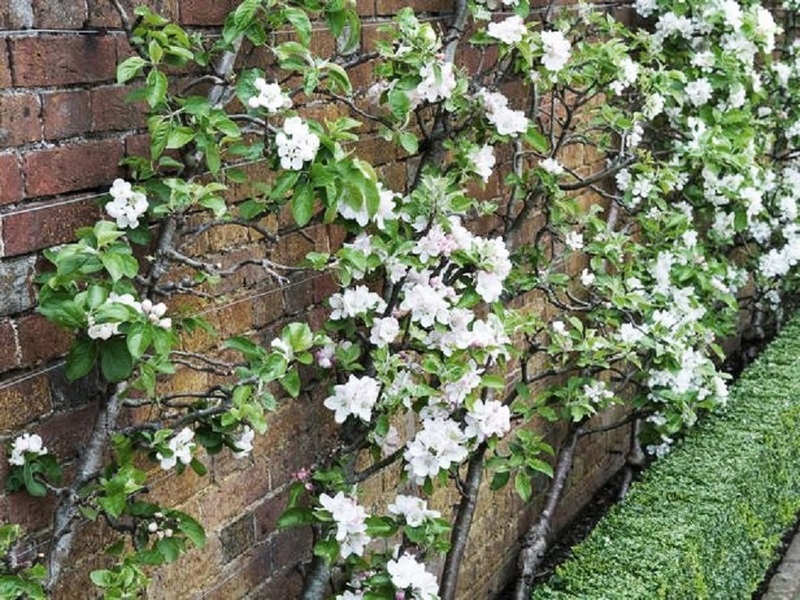 In the British American colonies & the early republic, where combining ornament with function was particularly admired, most espaliered plants were both useful & symbolic fruit trees. On June 18, 1767, Thomas Jefferson recorded in his Garden Book that "Argemone put out one flower" in his garden at Shadwell. On July 18 he noted another Prickly Poppy flower and observed that it was "the 4th this year," a testament to Jefferson’s appreciation of the natural world around him. 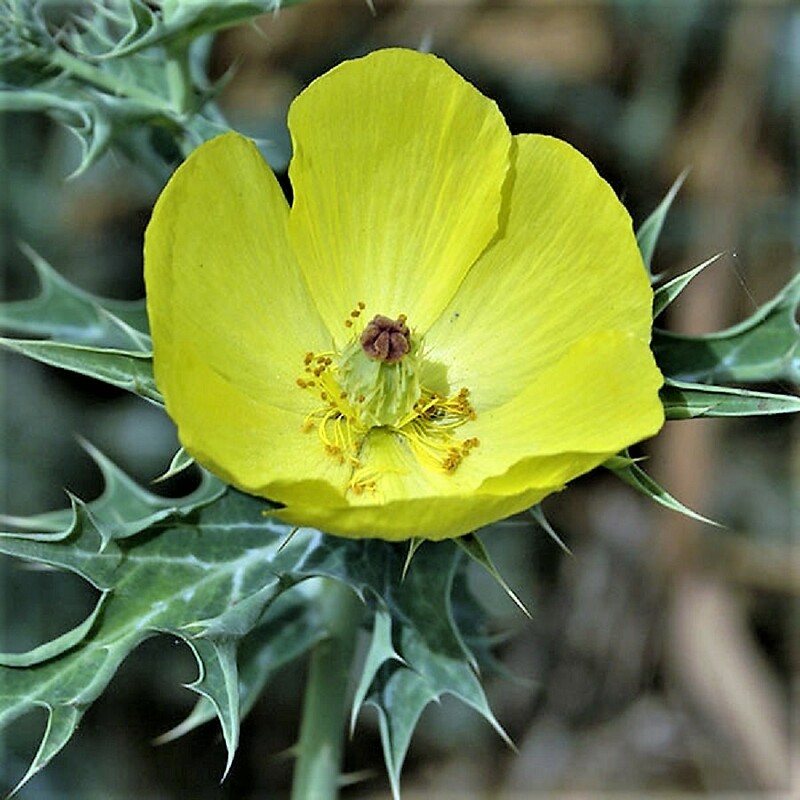 Philadelphia nurseryman Bernard McMahon sold Prickly Poppy, "Mexican Argemone," in 1804, which produces pale yellow flowers and attractive green and white-variegated leaves tipped with prickly spines, and reseeds readily. Article from The Salisbury Times (now called The Delmarva Times), Salisbury, Maryland - May 22, 1958 from the Delmarva Heritage Series, by Dr. William H. Wroten, Jr.
John Beale Bordley was born in February, 1727, four months after his father's death. His mother remarried for the third time and the young boy did not have a pleasant home life. So at the age to ten, he went to live with his uncle in Chestertown. He received his early education under the direction of schoolmaster, Charles Peale, the father of the famous American painter, Charles Willson Peale. 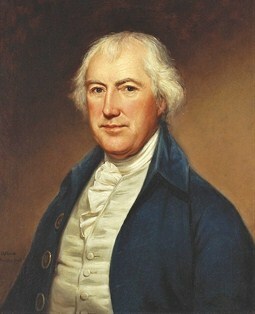 In his later life, John Beale Bordley arranged for the artist Peale to study in England under the famous American expatriate artist Benjamin West. Bordley, with the aid of others, saw to it that Peale had enough money for at least two years of study. Peale later painted four portraits of John Bordley, and also a picture of his two sons, Thomas and Matthias. At seventeen, John went back to Annapolis to live with and study under his attorney half-brother, Stephen Bordley. Before practicing law, however, he spent more time in studying history, philosophy, mathematics, surveying, and other fields of the arts and sciences. Shortly after his marriage to Margaret Chew in 1750, John felt it necessary to break away from the luxurious and fashionable society of his brother's world in Annapolis. He and his young wife went to live at Joppa, then in the "wilderness" of Baltimore County. For the next 12 or 13 years he worked his plantation and at the same time held a most lucrative clerkship, for Joppa at the time was the county seat. Later he moved to Baltimore City, where he was appointed a judge of the Provincial Court in 1776, and in the following year, a judge of the British Admiralty Court. In 1768, he had been one of the commissioners to help determine the boundary between Maryland and Delaware (some say Pennsylvania), and also served as a member of Governor Sharpe's and Governor Eden's Councils. The year 1770 was of great importance in the life of John Beale Bordley for his wife inherited from the Chew family half of Wye Island - the other half going to his sister-in-law, Mary, wife of William Paca, a signer of the Declaration of Independence and a governor of Maryland. Although the Bordleys maintained their winter residence in Annapolis, they moved to his beautiful estate on Wye Island in Queen Anne's County. For many years he was able to devote much of his time and wealth to agrarian experiments. From time to time he added to his holdings with the purchase of Poole's Island and farms on the mainland in Kent, Harford, and Cecil Counties. He farmed on a large scale and endeavored to improve practices of agriculture with the aid of imported machinery, seeds, and books on husbandry. It was because of his farming practice on Wye Island and on his other farms that Bordley became widely influential in the field of agriculture in this period of American history. Bordley personally conducted what amounted to an agricultural experiment station on Wye Island. Although tobacco had long been the basis of the Maryland economy, Bordley experimented with wheat and flax; which he proved to the other farmers could be grown successfully. He also condemned the two and three field rotation system in favor of an eight field system, which included three fields of clover in the rotation plan. Thus, even without the aid of chemistry, he had hit upon the contribution of legumes to the soil. He also experimented with hemp, cotton, fruits, many kinds of vegetables, and animal husbandry. Before long, the wharves that he had built at his plantation were busy for he had established a profitable wheat trade with England and Spain. However, despite the fact he had made a small fortune from this trade when the Townsend Duties were passed by England against the colonies, Bordley showed his patriotism by abiding with the policy of non-importation. Historian Scharf, quoting from memoirs of the Bordley family says, "When his foreign beers, wines, porters, ales, etc., began to diminish in his cellars, he started a brewery of his own, and planted a vineyard. He ground his own flour in his own windmills; made his own brick in his own brickyard and kiln; clothed his own servants in kersey and linsey woolsey, manufactured by his own looms from led, spun and wove his own flax; rotted and twisted hemp grown on his far in his won rope-walk; did his own carpentering and blacksmithing, and had his own private granary for the ships. When this independent Maryland farmer's beer was fermented, he put it away in casks made by his own carpenters, from timber cut down out of his own woods, and he even manufactured his own salt, from the Chesapeake Bay water, rather than be dependent upon Great Britain for anything." And when the Revolutionary War broke out, Bordley continued his personal fight with Great Britain. Poole's Island early became an important base for sending supplies to General Washington's army and other military units. And although he had gone to Annapolis at the beginning of the war, because of the danger of British raids on the Eastern Shore, he returned to Wye Island in 1778 to raise provisions for the American army. Shortly thereafter the British Tories and army stragglers attacked his plantation, but luckily they were driven off by the militia before much damage was done. In the meantime Bordley's first wife had died, and in 1777 he married Mrs. John Miffin, a widow of Philadelphia. From that time on the Bordley family wintered in Philadelphia instead of Annapolis. He soon became a member of the American Philosophical Society. In, 1785 he made probably his greatest contribution to development of American agriculture by encouraging the formation of the Philadelphia Society for Promoting Agriculture, of which he was vice president and actively interested until his death. Although this society was not the first of its kind, (the South Carolina Agricultural Society specializing in rice culture was organized in 1784), it was by far the most influential in promoting general agriculture. The Society's voluminous Transactions presented the results of the members' experimentation in agriculture. Bordley himself made important contributions with his writings about agriculture. At first the results of his farming operations and studies were published on cards, then on handbills, and as essays, before coming out in book form. Some of these works are A Summary View of The Courses of Crops, In The Husbandry of England and Maryland (1784) and Sketches on Rotations of Crops and Other Rural Matters (1797). His famous book Essays and Notes on Husbandry and Rural Affairs, published in 1799, with additions in 1801, contains 566 pages describing a system of farming based on rotation of crops and deals with the several kinds of crops, fruits, and animals grown on England and Maryland farms, manures, farm buildings, dairy products, food, and even the diet for farm people. Although the style of writing is clear and practical, some of the advice would seem strange to us today - "threshing wheat by driving 24 horses in four ranks around a large threshing floor until they traveled 25 miles." Bordley also had the time and knowledge to write on such other subjects as yellow fever, manufacturing, national credit, money, weights and measures, the last three topics being published in 1789 with a supplement coming out in 1790. Bordley, who died in 1804 and was buried in St. Peter's Churchyard in Philadelphia...None can dispute John Beale Bordley's right to be placed among America's foremost agriculturists. 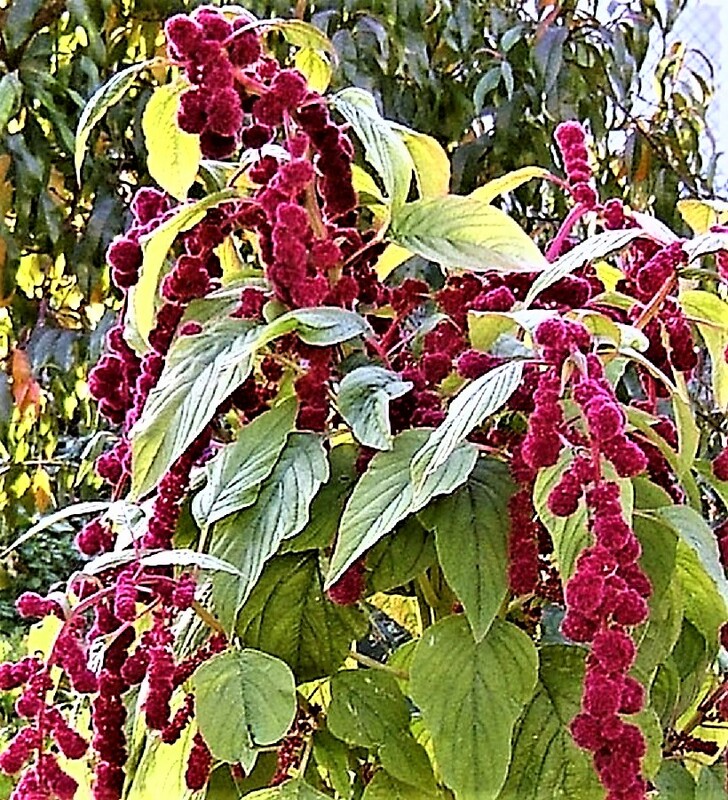 Thomas Jefferson included Joseph's Coat, or “three-coloured Amaranth,” in a shipment of seeds to his brother-in-law, Francis Eppes, from Paris in 1786. 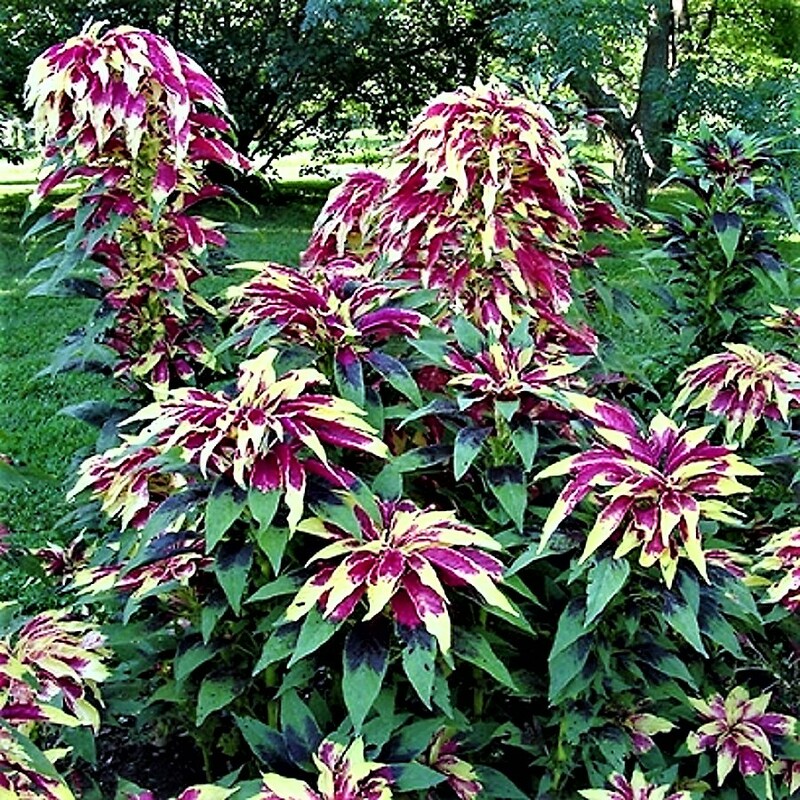 This brightly-plumed, tender annual is grown for its vibrant yellow and red foliage that provides an eye-catching display of color in the summer border. Most early American pleasure gardening gentry intentionally adopted classic, practical, geometric, ornamental gardens for their properties. Their landscape designs did often include avenues of trees leading to the plantation house, like rows of soldiers standing at attention. The new "English taste" garden design of the first decades of the 18th-century with its intentional serpentine walks & flowing lines in imitation of Nature was not particulaly attractive to early Americans, who were busy carving an obvious order out of the "howling wilderness" that surrounded them. Scotsman William Murray wrote to his cousin Dr John Murray near Charleston in 1753, advising him to adopt the English Taste for his new landscape plans. Redesigning their landscape to imitate Nature seemed a little impractical to many American gentry. Generally, American gardeners shared John Adam’s (1735-1826) negative attitude towards the excesses of the English natural grounds movement. During his 1784 tour of English gardens with Thomas Jefferson, he announced, "It will be long, I hope, before ridings, parks, pleasure grounds, gardens, and ornamented farms grow so much in fashion in America." In the same year, George Washington (1732-1799) wrote to the wife of Marquise de Lafayette (1757-1834) encouraging her to accompany her husband on a return visit to the new American republic. "You will see the plain manner in which we live; and meet the rustic civility, and you shall taste the simplicity of rural life." In 1783, Johann David Schoff traveled to Pennsylvania and wrote, "The taste for gardening is, at Philadelphia as well as throughout America, still in its infancy. There are not yet to be found many orderly and interesting gardens. Mr. Hamilton's near the city is the only one deserving special mention. Such neglect is all the more astonishing, because so many people of means spend the most part of their time in the country. Gardens as at present managed are purely utilitarian—pleasure-gardens have not yet come in, and if perspectives are wanted one must be content with those offered by the landscape, not very various, what with the still immense forests." In the early Republic, many gardeners strove for a balance of useful plants & trees & genteel design. On both town & country plots, most gentry, merchants, shopkeepers, & artisans planned gardens that were both practical & ornamental in geometric patterns. Some gentry who gardened were aware of the new English natural style & sometimes added serpentine entry roads & paths that meandered through the wooded edges of their grounds, but they overwhelmingly designed their gardens with traditional rectangular beds & approaching straight avenues of trees. Why were early American gardeners slow to adopt the English natural grounds movement? During the first decades of the 18th-century, English gardeners had begun to rebel against strict geometric gardens with rigidly trimmed topiary trees, and in favor of more natural garden layouts. The emergence of an informal garden style based on irregular rather than straight lines was influenced, in part, by travel books on the Far East, illustrating the winding paths & random rock formations in Asian gardens. English gardeners added Chinese structures to the garden, such as the 1760 pagoda at Kew Gardens. The chinoiserie persisted as books on the concept were published, notably William Chambers’s 1772 Dissertation on Oriental Gardening. The reading of classic landscape literature also encouraged the more natural, informal garden-park espoused by Virgil plus the idyllic images of the Roman campagna depicted by the 17-century French landscape painters Claude Lorrain & Nicolas Poussin. In mother England the landscape garden had become established as the new taste by 1750. The master of the English landscape garden was Lancelot "Capability" Brown (1716–1783), who transformed English landscapes into Elysian fields, at Blenheim, Stowe, & Claremont. Concentrating on sweeping undulating lines; serpentine lakes & walks; & the play of light & shade by rearranging hills & wooded areas, Brown created a series of picturesque scenes dotted with Palladian temples, classical monuments, & bridges. Brown's principles were expanded by Humphry Repton (1752–1818), whose successful career depended in part on his Red Books, illustrating his clients' estates before & after suggested landscape improvements. Repton introduced more picturesque sensibilities as well as glasshouses full of exotic specimens. 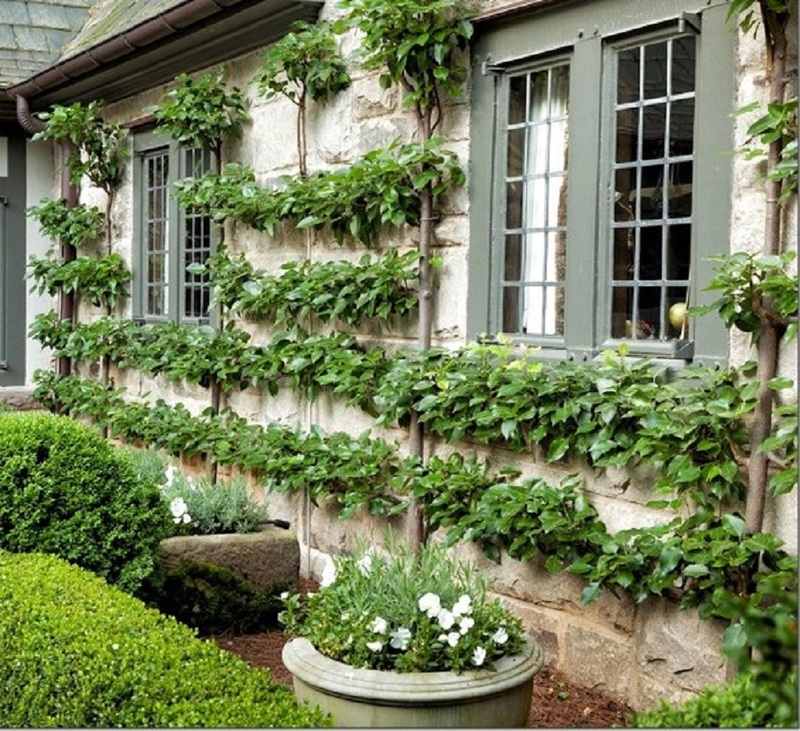 Early American gardeners were engulfed in untamed surroundings & their interest in ancient precedents prodded them toward designing the orderly gardens, that they planted around their dwellings. Early in his 1806 garden book The American Gardener, Philadelphian Bernard M’Mahon (1775-1816), described “ancient gardens,” by which he meant the gardens common a hundred years earlier in Britain & Ireland. Ironically, just as the English were rebelling against their “ancient” geometric garden designs, M’Mahon found America’s new citizens clinging to the formality of the classical past. Perhaps the young nationals were looking for the security of precedents to reinforce their present unsteady situation. The ordered & hierarchical implications of classical terraced gardens probably appealed to the gentry, who were losing their privilege of rank through association with the British & groping to maintain that privilege through natural, & therefore inevitable, order instead of through historical precedent. Americans found the enlightened ideas & orderly, geometric gardens of the Italian Renaissance particularly attractive during the early national era. Thomas Jefferson once boasted, “Ours are the farmers who can read Homer.” Southern gentlelady, Eliza Lucas Pinckney, recounted in 1742, “I have got no further than the first volume of Virgil…to find myself instructed in agriculture as well as entertained by his charming pen.” More than 70 years later, Jefferson’s bother-in-law Henry Skipwith wrote to a friend who was planning an orchard, “Virgil’s Georgics would have given you a full idea of his Quincunx.” Library records indicate that America’s literate gardeners were also reading Richard Bradley’s 1725 Survey of the Ancient Husbandry & Gardening, & Adam Dickson’s 1778 Husbandry of the Ancients, published in 1788, and the original writings of Columella, Virgil, Cato, & Pliny, whom they saw as providing models of day-to-day estate & garden management, including food production. One British visitor to the Chesapeake observed, “Frenchmen...appear to me to be the best judges of gardening in America, perhaps because their own climate & soil are more nearly similar to those of America, than either the English or Scotch.” Even Thomas Jefferson, touted by many as a promoter of the English natural grounds movement, claimed to admire the controlled, geometric French gardening above all others. Benjamin Henry Latrobe, upon his initial tour of America between 1795 & 1798, condescendingly noted the classical influence prevalent in the Chesapeake. He wrote that the gardens at Mount Vernon were “laid out in squares, & boxed with great precision…for the first time again since I left Germany, I saw here a parterre, chipped & trimmed with infinite care into the form of a richly flourished Fleur de Lis: The expiring groans I hope of our Grandfather’s pedantry.” Americans were clinging to European gardening traditions rather than adopting the natural grounds movement. M’Mahon had come from the British Isles when English landscape architects were abandoning Western traditions of formal garden design & embracing more natural forms, which were applied to the larger expanses they called pleasure grounds. The extreme formality of French & the fussiness of the miniature Dutch flower gardens helped spark this British movement against geometry & artificiality in the garden. Influenced by writers such as Joseph Addison & Alexander Pope (whom Charles Carroll of Carrollton claimed was his favorite poet), & by the romantic landscape paintings of the French artists Claude Lorraine & Nicolas Poussin, English landscape architects rejected centuries of traditional Western garden design. English garden design reformers, such as Lancelot “Capability” Brown, & their followers favored peaceful landscapes featuring created & controlled green lawns for grazing deer & livestock, stands of needed trees, & serpentine rivers that would invite fowl & animals. The English landscape itself was to become the ultimate garden. Intricately planned serpentine rivers & lakes reflected “natural” hills planted with carefully chosen trees & shrubs. M’Mahon’s gardening treatise reviewed the use of the popular English ha-ha, a wall or ditch sunk below the level of garden, which was intended to make the gentleman’s lawn appear to flow into the surrounding countryside. In England, where laws kept all but the rich from hunting deer & small game, these ha-has kept the hunting preserve of the gentry secure. Ha-has were used occasionally in the 18th-century Chesapeake, but they usually surrounded grounds still dominated by formal geometric gardens. The ha-ha was not just an invisible barrier to keep intruders out of the garden & grounds. It was simply the area that divided the stage upon which patricians exercised paternalism safely separated from their hopefully awe-filled audience, all of their lesser neighbors. The ha-ha was a device to make the gentry seem at one with their personal external environment, in which they could place themselves on top but within the safe confines of an invisible wall. Eighteenth-century English pleasure grounds were never truly natural. As M’Mahon explained, they were planned to look natural & were then decorated, often with classical Roman ruins or oriental ornaments. Chinese garden concepts excited the European gentry, when first reports of them reached Europe in the 18th century; but Western attempts to emulate Oriental design usually resulted only in copies of their architectural features. Chinese architecture directly influenced some 18th-century American homes & garden structures. Pagodas, garden houses with upswept eaves, & Chinese style bridges decorated a few American garden grounds, but the garden spaces themselves were still divided into geometric partitions, often on terraced falls. Until fairly recently, garden historians generally agreed that by the end of the 18th century, very few formal gardens, with traditional geometric bed designs, remained in Britain. This may not be the case, but apparently, the British had reached a level of sophistication that allowed them the freedom to resist their highly structured civilization & their hedged landscapes. This change, combined with the need to conserve dwindling supplies of timber & game, led to the natural grounds movement in England. The movement did not spread quickly in America. 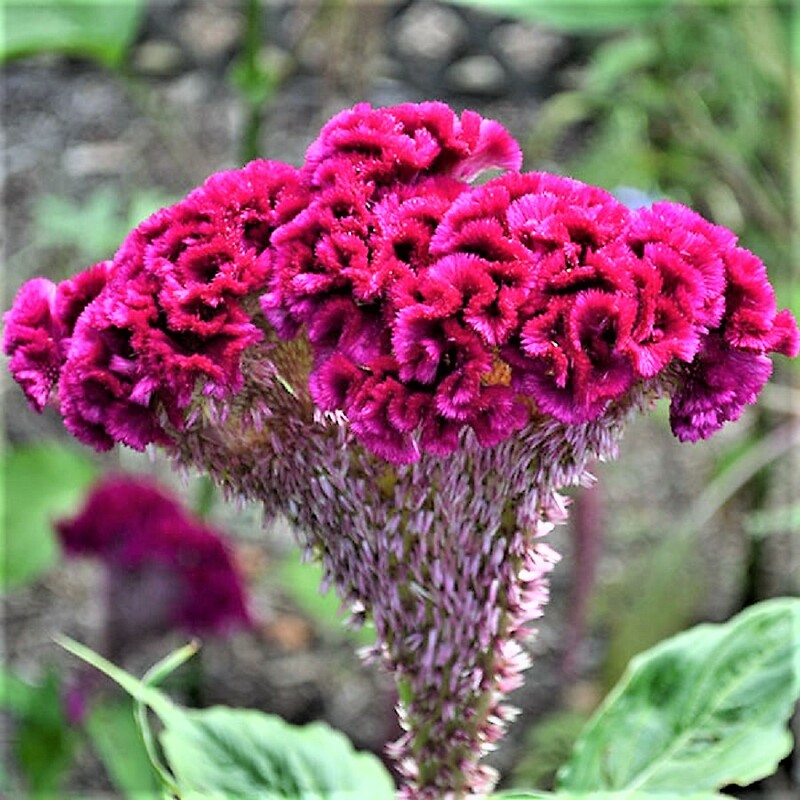 When Thomas Jefferson noted "amarenths" on an 1806 list of flowers, he was probably referring to Love-Lies-Bleeding, a curious summer annual cultivated by the earliest American flower gardeners. Its common name suggests the unusual, cascading red flowers that droop almost to the ground and can be cut for fresh or dried arrangements. By the middle of the 17C, British American colonial gardeners were beginning to recognize that they needed books reflecting the local conditons on this side of the Atlantic. Early colonial almanacs focused on the seasonal changes, the tides, the weather, and celestial occurances used as guides for planting. Most colonials living along the Atlantic coast believed that astrological changes had a direct affect on their gardens and crops. In 18th century Virginia, Landon Carter recorded in his diary that his field was "dry everything as Usual, and nothing has grown this whole week. Its my 3d planet that governs, and I shall not this year amount to a groat." This woodcut of a few sheep; some fierce (but dumb) guard dogs; a wolf carrying away a lamb; the moon & stars; and a tipsy shepherd carrying with an early bag pipe may have boosted the seasonal calendar craze. It is from the 1556 Kalender of Shepherdes. 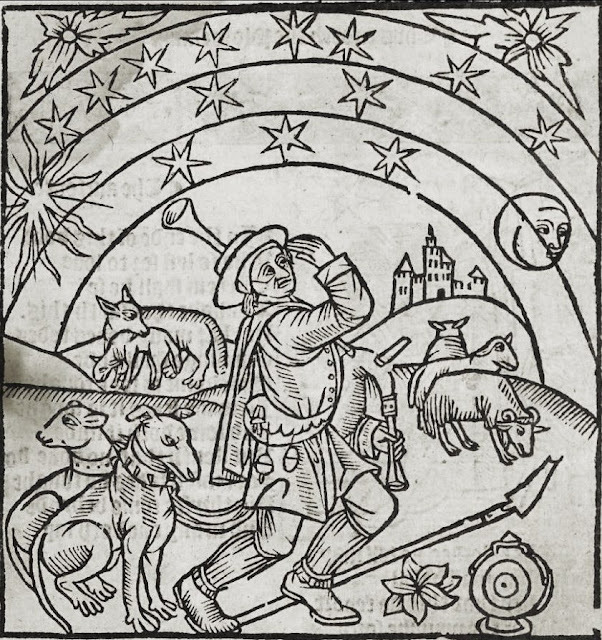 The Kalender of the Shepherdes is an archetype of the 17th century farmer's almanac. The 1556 Kalender, influential in literary, religious, & social realms, was fundamentally about achieving salvation. The astrological charts & sherherd's folk wisdom about harvests, diet, & medicine were included as enticements to the religious instructional core of the work. This included the 10 commandments, the 7 deadly sins, & some of the lines of the modern Hail Mary prayer. By 1640, almanacs published in England were exploring social, political, & religious issues and some included a bit of doggerel verse & homey advice; but the principal part of each booklet was devoted to a calendar with moon phases and planetary movements. In 1457, Johannes Gutenberg printed the first almanac; and by the 1660s in London, almanac sales averaged about 400,000 copies annually. The first American almanac that I know of was published in 1639, an Almanack Calculated for New England, by William Pierce, Mariner, and was printed on the year old Harvard press. Printed in 16-page book form, early American almanacs usually included a title page, information on eclipses, the annual calendar, plus notes on local court days. In 1646, Samuel Danforth published a 16 page almanac containing some astrological gardening information on the press in Cambridge, Massachusettes. Almanacs also appeared in New York and Philadelphia before 1700. In 1732, Philadlephian Benjamin Franklin began publishing Poor Richard's Almanac and in Williamsburg, the Virginia and Maryland Almanac also began publication that year. A year later, Thomas Whitemarsh printed his South Carolina Almanac in Charleston. John Tobler published in Georgia and South Carolina Almanac in Savannah in 1764. All of these periodicals contained some astrological gardening instruction. Boston almanac producer Nathaniel Ames wrote in 1764, after publishing almanacs since 1726, Astrology has a Philosophical Foundation: the celestial Powers that can and do agitate and move the whole Ocean, have also Force and Ability to change and alter the Fluids and Solids of the humane Body, and that which can alter and change the fluids and Solids of the Body, must also greatly affect and influence the Mind; and that which can and does affect the Mind, has a great Share and Influence in the Actions of Men. In South Carolina in 1752, Martha Daniel Logan (1704-1779), a widowed mother of 8 who ran a finishing school at her plantation & sold garden seeds, compiled a more practical garden calendar reflecting the South Carolina environment, which was published in John Tobler's South Carolina Almanack and other almanacs for years to follow. Martha's father Proprietary Governor Robert Daniel, who operated a nursery, died when she was 13. She inherited his business & plantation on the Wando River. The 1753 South Carolina Gazette carried Martha Logan's advertisement for A parcel of very good seed, flower roots, and fruit stones to be sold on the Green near Trott's Point. After her husband George Logan Jr died, she corresponded & exchanged seeds in a "little silk bagg" with botanist John Bartram in Philadelphia. He wrote to a friend in London, "Mrs. Logan's garden is her delight." They commiserated about the problems of saving seeds & bulbs from season to season. Martha wrote Bartram: "I have lost my tulips and hyacinths, I had in a closet to dry and the mice ate them." About 1765 in Virginia, John Randolph (1727-1784) wrote what is believed to be the earliest American book on kitchen gardening, A Treatise on Gardening by A Citizen of Virginia. John Randolph was the last King's Attorney (Attorney General) in the colony and was dubbed "John the Tory" because of his loyalist sympathies. His roots in Virginia were deep. His father was Sir John Randolph, the only colonial Virginian to be knighted. As a young man, John Randolph was a close friend of Thomas Jefferson, his cousin, with whom he often played violin. His son Edmund became Governor of Virginia and Attorney General of the United States. John Randolph's Treatise on Gardening, modeled on the works of English nurseryman Philip Miller, was printed in America in 1788, four years after his death. Randolph's 80 page treatise on Artichokes, Asparagus, Beans, Cabbage, & had a brief calendar at the end. The information contained in John Randolph's Treatise on Gardening by a citizen of Virginia & The American Gardener rarely disguised wholesale borrowing from Philip Miller's 1831 Gardener's Dictionary. A leading agricultural figure in Pennsylvania & Maryland after the Revolution was John Beale Bordley (1721-1804). Bordley studied law & held several important colonial offices. However, his interest lay in agricultural reform; and in 1770, when he came into possession of a plantation containing 1600 acres on Wye Island on Maryland's Eastern Shore, he gave up the law entirely. Bordley farmed this land for decades, while he experimented with new theories for native agriculture. He grew wheat instead of tobacco & experimented with crop rotation. Like the Carrolls, he imported both seed & agricultural books from England. In 1785, he was a leader in forming the Philadelphia Society for Promoting Agriculture. In 1784, Bordley published A Summary View of the Course of Crops, in the Husbandry of England and Maryland. He published his Sketches on Rotation of Crops and Other Rural Matters in 1792. His most important work was Essays and Notes on Husbandry and Rural Affairs, first published in 1799, & revised in 1801. It contained over five hundred pages describing crop rotation, fruit culture, fertilizer, plantations, & farm buildings comparing English with newly developing American agricultural methods. He also wrote Gleanings from the Most Celebrated Books on Gardening and Rural Affairs published anonymously in 1803, in Philadelphia, just a year before he died. Washington D.C. gardeners, David Hepburn and John Gardiner combined their knowledge with information lifted from English kitchen gardening books to publish The American Gardener in 1804 in the new District of Columbia. Certainly the 1804 The American Gardener was written to promote the professional gardening careers of Gardner & Hepburn. In 1818, Joseph Milligan, at Georgetown, published a second enlarged edition of "The American Gardener, containing directions for working a kitchen garden every month in the year and instructions for the cultivation of flower gardens, vineyards, nurseries, hop yards, green houses and hot houses. To which is added a Treatise on Gardening by a citizen of Virginia." In this edition, the publisher wrote "The recommendations with which this work came forth in the first instance to the American public were these: At a time when no work of the kind, adapted to the climate of the United States, had fallen from the American press, Mr. David Hepburn, a gardener of forty years experience— twenty in England and twenty in this country—aware of the inconvenience and frequent loss of crops sustained all over the Union, by the want of some book of methodical instructions, in company with Mr. John Gardiner, a person of skill and experience in horticulture, prepared the work in question for the press, and it was published at Washington in the year 1804 with a certificate from General J. Mason, which stated that the said Hepburn 'had been for six years employed by him on Mason's Island, Georgetown; that he had for that time conducted all the improvements at that place; that he parted with him with great regret; that he could with truth say, Hepburn was well skilled in all the branches of gardening, and that as a practical man in the culture of vegetables and fruit trees he could not be excelled.' "
Immediately after the Revolution, clever European gardening entrepreneurs immigrated to America to entice the new nationals to buy their books, seeds, & services. They set about to create a market not only among the already pleasure gardening gentry, but also among the rising merchant and artisan classes as well. And they succeeded. At the end of the century, pleasure gardening was growing. Ladies were becoming more interested in decorative flowers & potted plants offered to them by the new seed and nursery dealers. Men were collecting new specimens of plants imported from throughout the Americas and Europe. 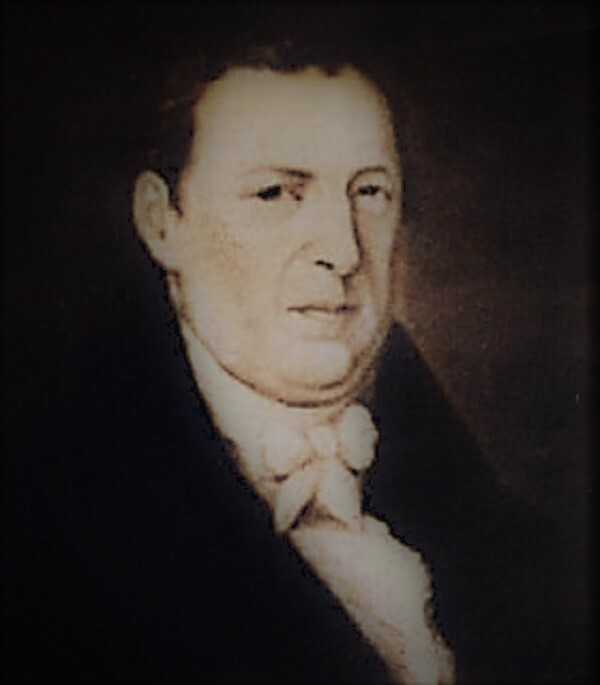 The most important of the new garden entrepreneurs was Bernard M'Mahon (1775-1816), who came to Philadelphia from Ireland in 1796, to establish a seed and nursery business. "He enjoyed the friendship of Thomas Jefferson...the Lewis and Clark expedition was planned at his house...(he was) instrumental in distributing the seeds which those explorers collected." In 1806, M'Mahon wrote The American Gardener's Calendar, which was printed in 11 editions between 1806-1857. A Philadelphia newspaper called the book "a precious treasure" that "ought to occupy a place in every house in this country." M'Mahon's main motive in writing was to expand his profitable nursery enterprise. Almost all of America's earliest indigenours gardening books served as the liason between the nurseryman & an emerging middle-income group of home gardeners. An increasing leisure time & interest in the craft grew, there were not enough trained professional gardeners to go around nor the funds to employ them. By 1806, M'Mahon understood the proud new country well enough to appeal to guilt and national hubris in his efforts to sell his readers on the concept of pleasure gardening. In his introduction, M'Mahon lamented that America had "not yet made that rapid progress in Gardening...which might naturally be expected from an intelligent, happy and independent people, possessed so universally of landed property, unoppressed by taxation or tithes, and blest with consequent comfort and affluence." M'Mahon concluded that one reason for this neglect was the lack of a proper reference book on American gardening, a situation which he volunteered to rectify. In 1804, his catalogue of seeds included 1,000 "species." 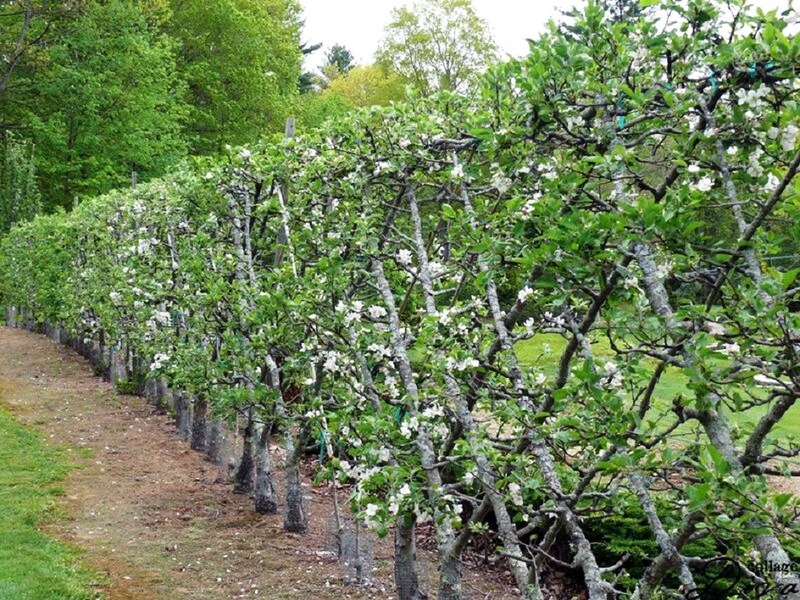 A contemporary wrote, "Bernard M'Mahon found American gardening in its infancy, and immediately set himself vigorously to work to introduce a love of flowers and fruit. The writer well remembers his store, his garden and greenhouses. The latter were situated near the Germantown turnpike, between Philadelphia and Nicetown, whence emanated the rarer flowers and novelties, such as could be collected in the early part of the present century, and where were performed, to the astonishment of the amateurs of that day, successful feats of horticulture that were but too rarely imitated. His store was on Second Street, below Market, on the east side. Many must still be alive who recollect its bulk window, ornamented with tulip glasses, a large pumpkin, and a basket or two of bulbous roots; behind the counter officiated Mrs. M'Mahon, with some considerable Irish accent, but a most amiable and excellent disposition, and withal, an able saleswoman. Mr. M'Mahon was also much in the store, putting up seeds for transmission to all parts of this country and Europe, writing his book, or attending to his correspondence, and in one corner was a shelf containing a few botanical or gardening books, for which there was then a very small demand; another contained the few garden implements, such as knives and trimming scissors, a barrel of peas and a bag of seedling potatoes, an onion receptacle, a few chairs, and the room partly lined with drawers containing seeds, constituted the apparent stock in trade of what was one of the greatest seed-stores then known in the Union, and where was transacted a considerable business for that day. Such a store would naturally attract the botanist as well as the gardener, and it was the frequent lounge of both classes, who ever found in the proprietors ready listeners, as well as conversers; in the latter particular they were rather remarkable, and here you would see Nuttall, Baldwin, Darlington, and other scientific men, who sought information or were ready to impart it." American garden books, epecially M'Mahon's, which grew in demand & popularity from 1646 through the first years of the 19th century, marked the transition from America's 18th century dependence on English farming & gardening books to the widespread American agricultural publications that flowered up & down the Atlantic coast during the first decades of the nineteenth century. 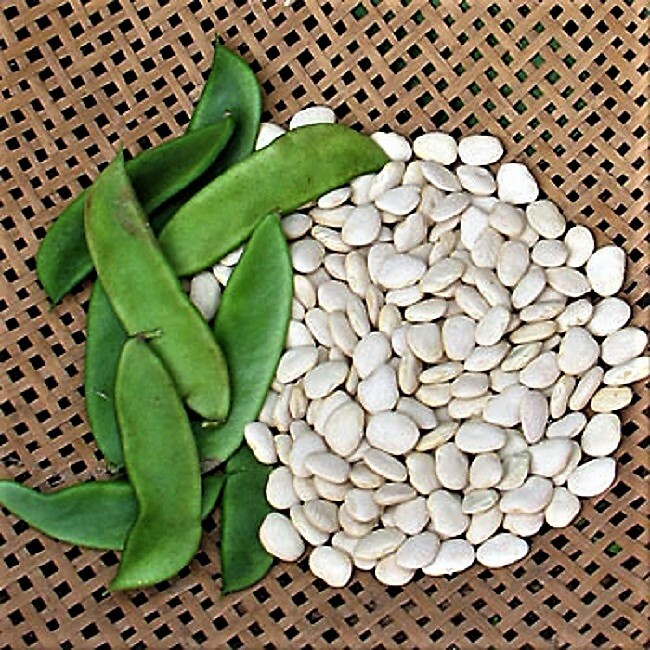 Lima beans were a hot-weather favorite of Thomas Jefferson, who sowed them yearly from 1809-1824. Monticello’s gardener, Robert Bailey, saved seed of White Carolina beans in 1794. Also known as Sieva, this variety is small and delicately-flavored. Originally from South America and grown by Virginia native tribes, lima beans were also called “bushel,” “sugar,” or “butter” beans in the 1700s. The whole yard and its buildings, should be in view from the mansion; and that they be construdted at a proper distance, neither too near nor too far from the mansion. The food should be near to the housed live slock, for readily distributing it. The yard ought to be compact; and the doors of the buildings, and the gates of the yard, seen from the mansion. It is not to save ground that compactness is here desired; but that the attentions due to the live stock may be performed in the readied and best way. A yard containing cattle always housed, is never to be littered with straw, but all litter carelessly dropt on it, is to be raked off, for security against fire dropt on the way to the boiling house; and the beasts are not suffered to stroll about wasting dung and urine. When let out and watered, they are to be instantly returned to their stalls, regularly in detachments, one set after another. The Prairie Rose (R. setigera) is a North American species first cataloged in 1810, with single, deep pink flowers and flexible canes. During the 1840s Joshua Pierce, a rose breeder from Washington, DC, introduced a series of setigera seedling roses that bore double flowers. 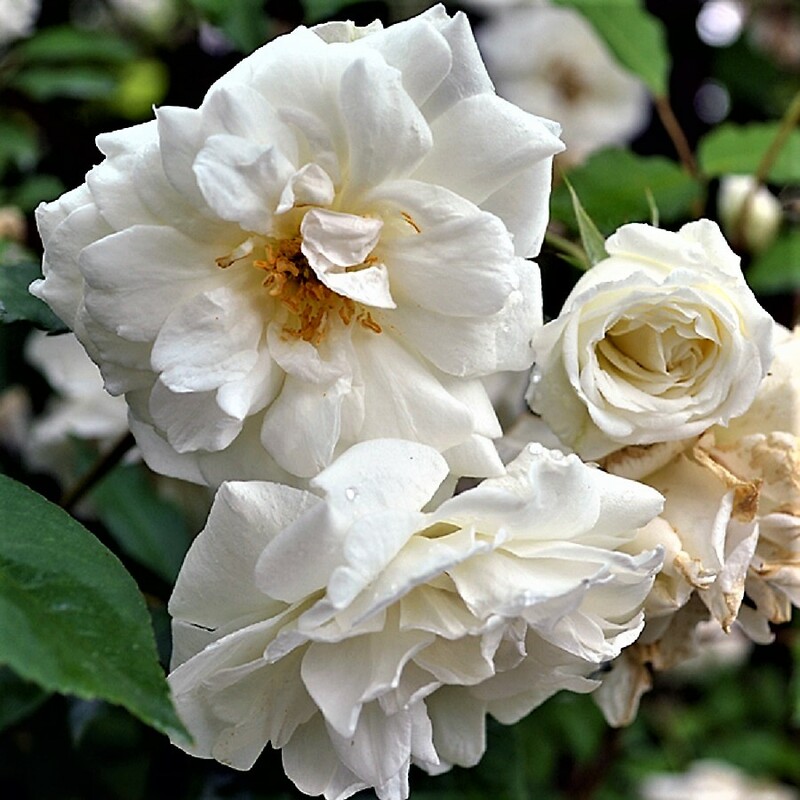 Before 1846 Pierce selected and introduced 'Pride of Washington', along with eleven other hybrid forms. The Prairie Roses were initially extolled as the great American Rose, but they have become increasing rare in commerce and in the wild.